Must-have pieces. Make sure you keep on top of the fall/winter trends by investing in one of these men’s trench coats. Trench coats are a classic style which are never going to go out of fashion – but right now, they’re on the rise to be one of the most popular men’s coats to own this year. 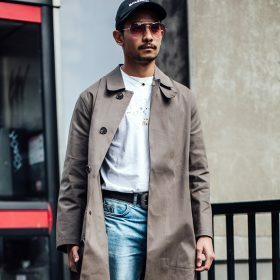 You can transform a simple tee and Levi’s outfit by adding in a men’s trench coat; the latest changes in fashion means it doesn’t always need to be worn in a business casual way. Why not start off by exploring the navy collection available at Fashiola or checking out the blog section for some inspiration.